BacktestRenko is the first multipurpose hybrid Renko bar. This distinctive tool accomplishes multiple tasks in one package. In other words, the SiBacktestRenko is two bar types in one. #1 Wave mode On. This creates a smooth wave like action. Phantom bars will be created if necessary to fill gaps. #2 Wave mode Off. This mode reveals the true Open price of the bar for more acturate back-testing results. #3 Short bars, like this with no tail, indicates a strong move in price. Trending information you will miss when using other Renkos. Backtest Mode = On (as seen on top) generates the standard median Renko style that has become a favorite among day traders. Its magnetism and popularity is due to the smooth wave-like style that it embellishes the chart with. Finally, a trading instrument that is easy on the eyes and simple to follow! With Backtest Mode = Off (as seen in the middle), an even higher level of accurate back-testing is accomplished. In this mode the SiBacktestRenko exclusively utilizes true trade data for the Open, High, Low, & Close of each bar. Even price gaps are accurately portrayed, which is yet another first of its kind. The original Renko bar was designed to smooth out price movement, but it sacrifices accurate back-testing. When using this mode, the SiBacktestRenko will only show you the truth. 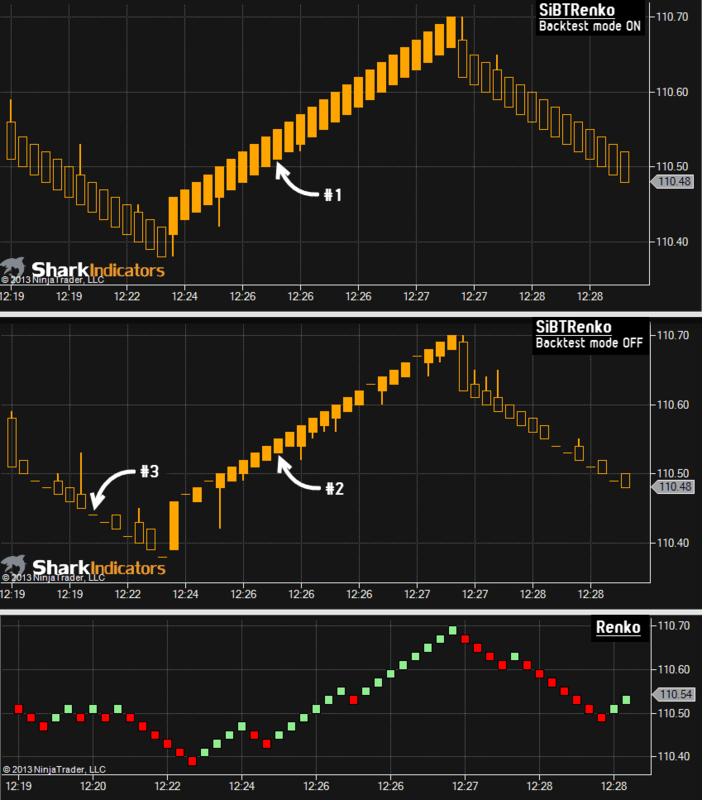 Simply put, it is the most accurate Renko on the market for back-testing.